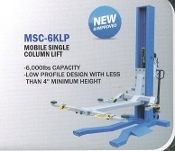 SC-2K Single Column Storage Lift 2000 lbs. TP15KCX Heavy Duty 2 Post Lift 15,000 LBS. Capacity TP9KACX Automotive Lift Clear Floor Type Asymmetric 9000 LBS. TP9KFX Two Post Symetric Automotive Lift 9000 lbs.